The Lady of Shalott - Mirror Breaking Illustration by Howard Pyle, 1881. 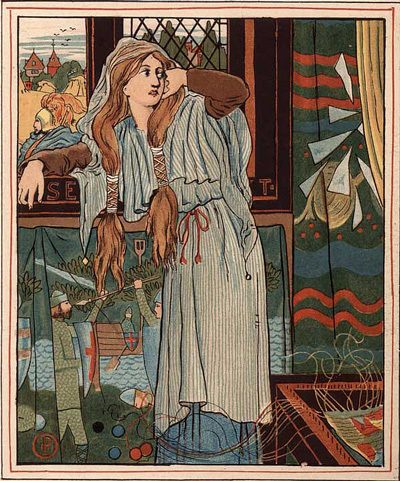 In his poem The Lady of Shalott Tennyson employs a number of unfamiliar or archaic terms. Many of these words are perfectly in keeping with the medieval setting of the piece, but they can sometimes prove challenging even to native English speakers. Here they are, listed in order of appearance, along with a brief explanation for each one. = a legendary castle housing the knights of the grail. = white flowers associated with Christian mysticism. = a place inhabited by the lady of the poem. The island where her tower is situated. = trees often found near river banks or water and whose leaves are pale on the underside, especially in a breeze. ie. willows whiten. = a type of poplar tree with light underside to its leaves. = encloses, shelters, contains. A bower is a green, peaceful and sheltered space located in a garden or forest. = the edge of the river. = here, the verb 'trail' is used in the sense of pulling something along. The 'slow horses' are towing the barges, not following them. = a shallow-draft boat suitable for river traffic. = tall, old-fashioned window that opens on a vertical hinge. = farm labourers cutting grass or grain crops such as barley. = grain stalks or straw bundled together for storage or transport. = the use of coloured threads to make decorative fabrics. Stay = in this context, meaning to cease or to leave off from a specified activity. = a swirling current within water. = uncouth young men of the village. = young women, usually maidens. = head of an abbey or monastery. = young male servant, usually to a nobleman or lady. = mounted nobleman of martial prowess who served or protected the interests of a king or queen. = decorative combinations of feathers, often attached to headgear, vehicles or horses. = the distance an arrow might travel when fired from a bow. = the rooftop above where the lady resides. = items of clothing or armour that protect the lower legs. = one of the principal knights of the Grail (the sacred, holy vessel). = glittering bridle used to control the horse. = a diagonal belt worn over the shoulder for attaching weapons or instruments. = prominent shooting star with a slow trail. = a joyful exclamation of no particular meaning. = the frame or apparatus on which weaving is done. = the front end of a boat. = a visionary or mystic. = a song. In medieval times not necessarily associated with Christmas. = a long room, in this context located within a prestigious building or castle. = a lifeless body - a corpse. In some later versions of the poem this has been replaced with the words “dead-pale”. = wooden jetties or platforms constructed between the shore and water. = prominent or leading townsman or citizen. = a state of favour or forgiveness. A blessing of sorts.